Israeli soldiers injured, Friday, at least fifteen Palestinians with live fire, and caused dozens to suffer the effects of teargas inhalation shortly after the weekly Great March of Return started near the border fence, in the northern and eastern parts of the Gaza Strip. Medical sources said the soldiers instantly resorted to the excessive use of force, and fired dozens of live rounds, wounding at least fifteen Palestinians. They added that the Palestinians, who were shot with live fire, were rushed to local hospital, suffering moderate-but-stable injuries. Dozens of Palestinians, including medics and journalists, suffered the effects of teargas inhalation, and received the needed treatment. 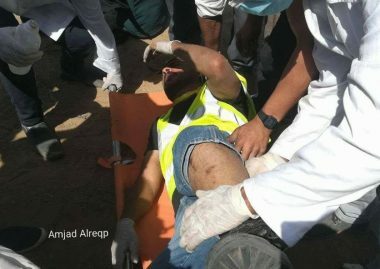 In addition, an Israeli army sharpshooter shot a young man, just as he flew balloons carrying the colors of the Palestinian flag, east of the Zeitoun neighborhood, southeast of Gaza city, wounding him in the leg, before he was rushed to the Shifa Medical Center.